Because I just got laid off and am about to be bah-roke. Well, not really. But still. It's kinda scary since for the last 9 months or so, I've been working so much and have been so busy. To go from working 50+ hours a week to napping on the couch at 2:30 pm (I woke up early to go to bootcamp this morning, okay?!) is a huge difference. I was pretty much in a daze most of the afternoon yesterday. Did that really happen? Several people had already been let go that morning. But they're manager was kind enough to give them some notice. It would have been so much kinder and gentler had I known. Did they really think I was going to sabotage something? Instead, I look down at my caller ID and see the HR guy's name. My heart sank. I quickly sent some of my personal stuff on my hard drive to my personal email and went into the meeting. Blah blah blah. Financial situation. Blah blah. You'll have 20 minutes before your computer is shut down. Blah. Trying to stay positive. I still have my 2nd job and my manager there is going to see if they can give me more hours. I'm still hoping that this will eventually turn full time. Really, this could be a blessing in disguise. In the meantime, I do need a break. I've been exhausted! I filed for unemployment and have nothing planned. I guess I'll figure out later. This is the first time since I finished college nearly 10 years ago that I haven't been employed full time. I'm a little scared.. And even more excited. I've been (guiltily/lazily) Twittering much more than blogging. It's just fast and easy. Instant gratification s'il te plait. I really haven't even been reading my favorite reads. I think in reading other people's well kept blogs, I feel even more ashamed that I'm not keeping up. It's like Rebecca Bloomwood hiding her bills in a drawer rather than dealing with the reality - minus the bad credit. The last race that I did was the Furry 5K. Since then, I've unfortunately been suffering from shin splints and have basically sidelined my racing days. I did, however, participate in my favorite race as a walker with my dad! Woke up early, picked him up and off we went to walk the Shore Run. My dad was really nervous about it and had been "preparing" for it by walking on his treadmill before taking the doggy out for his morning walk! Isn't that too cute? Afterwards, we went to brunch! That's always the best part. Dad's eager to do the next 5K! Swedish 5K anyone? It pretty much kicks my arse during the hour but I haven't been getting sore. Must work harder!! I'm bringing my dumbells this week. I still haven't lost any weight at all. Muscle-schmuscle! I want to see a smaller number dammit! And we have a winner! I know you've been all dying to find out who gets the glorios Current Elliot skinny slouch jeans! All this excitement about jeans and guess who the winner is?? Darling Jean, please email me directly with your jean size and mailing address! I can't stop thinking about getting new jeans! But I can't really decide what I want. Normally, I prefer plain jeans with zero embellishments and no distressing or "whiskers". My favorite jeans are J Brand. But lately, I guess since I've been hosting the Current/Elliot giveaway (have you entered yet?? ), I've been obsessing over those skinnies (ugh, can I win my own giveaway?) 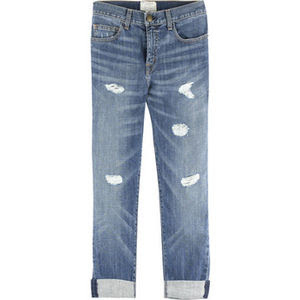 as well as the boyfriend jean. Seriously, they're totally not my style and I totally thought Katie Holmes looked completely ridic when she started sportin' them. Then I see Rachel Bilson and Reese Witherspoon wearing them.. And they look so darn cute! It makes me wonder if I'd look that cute wearing a scrubby tshirt carrying my dog around town! Maybe I should get something less hole-y though - like these Rich & Skinny ones. They're a little cleaner, which is more me. Or maybe I should just go out on a limb and be crazy. And forget about suggesting that I steal my actual boyfriend's jeans. They'd be too small. *shame* He wears baby size 28 and they're loose on him - real boy jeans don't account for real girl booties. These (birthing) hips don't lie.